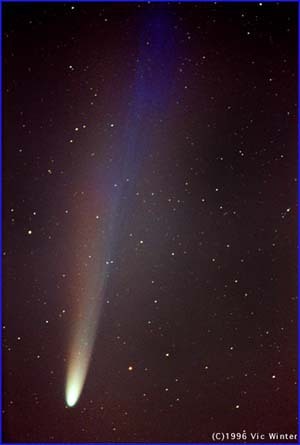 As our angle of view of the comet changes, the separation between the dust and plasma tails can easily be seen. Photographed by Vic Winter with a 500mm lens at f4 A star-guided piggyback exposure of 5 minutes on Fuji Super G 400 ASA Color Negative film. Exposure began at 9:13 p.m. C.D.T. on April 18th, 1996. Clear skies. Location: A high hill on the farm of John and Jean Wrightfield, located 20 miles north of Kansas City near Holt, Missouri, USA. (C)1996 Vic Winter.